I'm trying to prepare for BricksCascade, and I have a couple of models I want to construct. But I inevitably have to go thru the pile from last year, which includes a bunch of partial MOCs and sets that I've been meaning to part out and sort, but never got around to it. And... that pile is intimidating. I wish I could get a full team of AFOLs to come sort it all in an afternoon like I've seen em do at PortLug... but I don't know that many people in the area, and my house is a big enough mess even without the Lego. The line of classic Ninjago at the beginning of 2017 was a bit mellow, probably because they were expecting to go big with the movie later in the year. The snake villains felt like another repeat, and the Ninja costumes got Metru-fied (they started using the darker tones) which I didn’t like. I picked up Destiny’s Shadow and Samurai VXL, which were decent sets, but far from the best the theme has to offer. 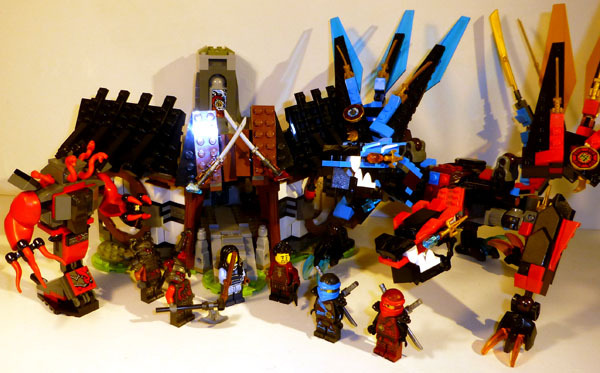 But then you look at Dragon’s Forge, which is easily the gem of the wave. The dragon’s design isn’t exactly revolutionary, but the clever combination of the blues and reds and the two heads work out nicely. (The dragon’s been on display at my work desk since I picked up the set, that’s how good I think it is.) Plus, the blacksmith’s hut is a fairly sizable structure, and it swivels opened for better access to all the play features, while still looking good from the outside. 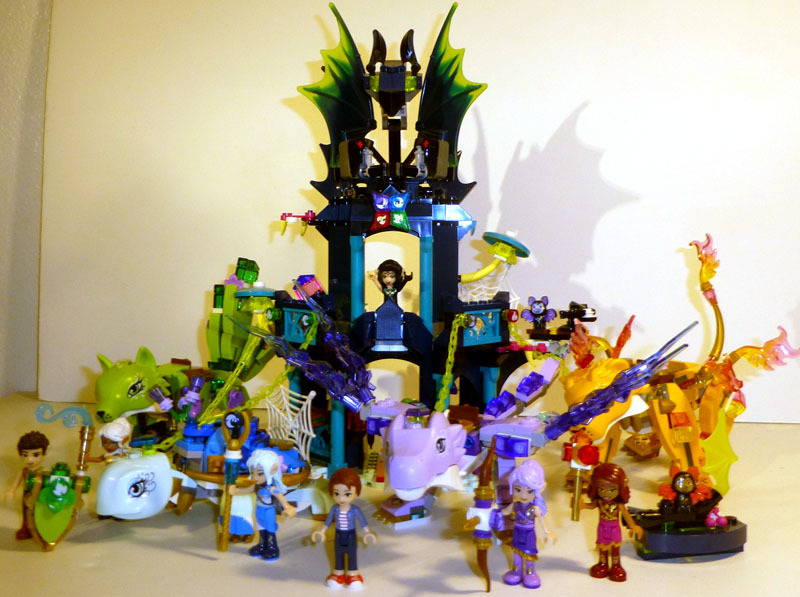 That, and you get Kai and Nya’s parents as figs, so this set was easily a win. It’s not that the Elves line for 2017 was bad, it’s just that 2016 was hard to follow, and my budget isn’t endless. 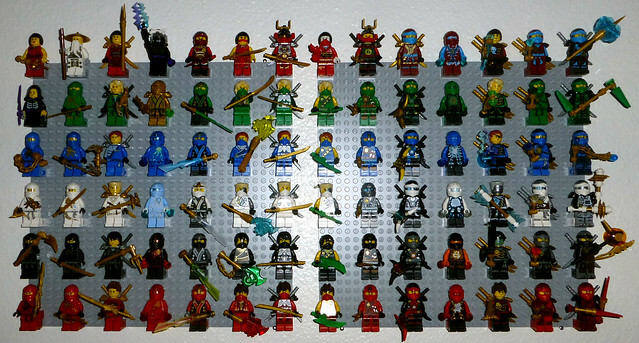 (A majority of my money went to the Ninjago theme, which meant I didn’t venture too much into other various themes.) The goblins weren’t particularly interesting IMO, and some of the buildings either felt meh-worthy or just more of the same. I even picked up Rosalyn’s Healing Hideout for the dragon, which is nice in dark blue, but the design isn’t really new. (Never did grab the evil dragon, been meaning to.) But then there’s the airship; while reminiscent of Nadia’s boat from the first year, it has enough clever design features to get me interested. The elegant gold curves on the edges were nicely done, and the action feature with the wings works out too. Plus, purple boomerang! (And I wrote a mini review of it too.) If you only had to pick one Elves set from this year, this would be my recommendation. Okay, to be fair, this list is based off what I bought this year (and narrowing it down even further, what I’ve bought and built.) 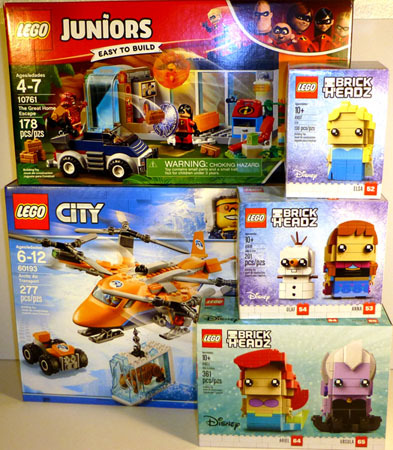 Super Hero sets tend to be pretty far down the list as far as quality is concerned, outside maybe fig designs. That said, Thor: Ragnarok was a good movie and this set did a decent job of showing it off. You get most of the main characters here, including the main baddie Hela, the newbie Valkyrie, a snazzy redesigned Thor, and Bruce Banner as a fig (finally.) All the figs are well done and worth of a collection. The Fenris wolf build is similar to the Legends of Chima Legend Beasts, but the detailing on it works. The design and size make is movie accurate too, I believe. 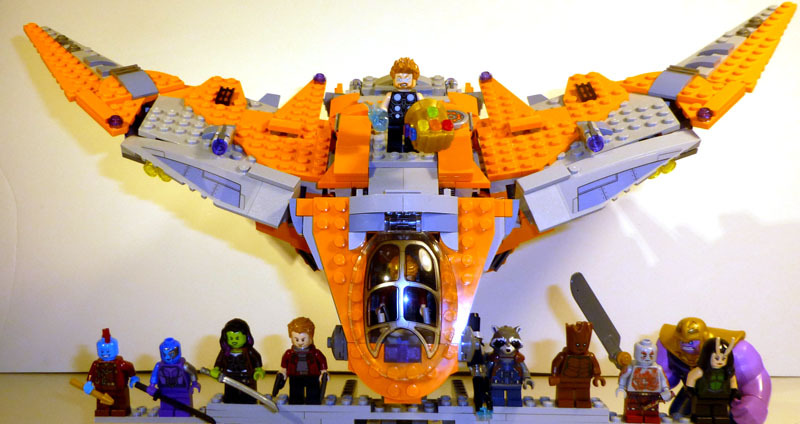 I wasn’t really expecting much from the Commodore spaceship, given that Lego doesn’t always do space vehicles justice. And although they’ve really scaled it down, the shape and colors are all there. 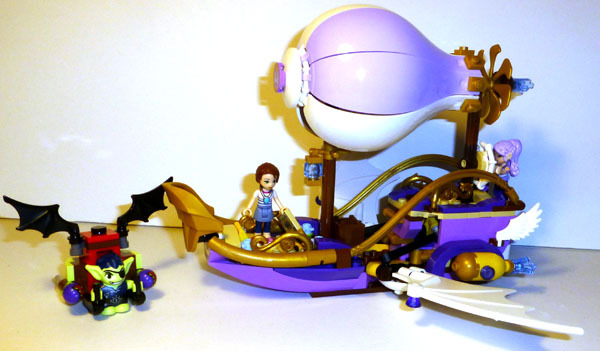 It even has the drop bay in the center from the movie (although clearly without the necessary space for the minifigures to properly stand inside it.) The one bit that is off from the movie is the stud shooters, since they made a big deal about how the ship didn’t have any weapons initially. Oh well, I guess Lego needed the action feature. Anyway, the set gets onto the list for exceeding my expectations. I wouldn’t say this has been a great year for CCBS, and I actually didn’t buy a single set with this primary building style. (I did, however, win a bunch.) The main reason is that CCBS is now limited entirely to Star Wars characters, and the last few waves have been pretty bland. I’m getting tired of the same humanoid build (there’s only so many ways you can make a “realistic human” shape. At least the Toa could go off in different directions build wise) and the color schemes have been generally pretty dull. (It was nice to get some tans and browns at first… and now that’s all we get, besides black, white, and red. The Boba Fett next year does add a space of new color to the mix.) 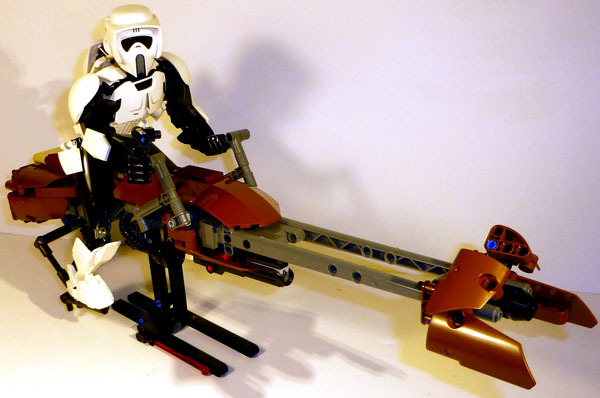 But the fun bit with this set isn’t the Scout Trooper but the Speeder Bike. 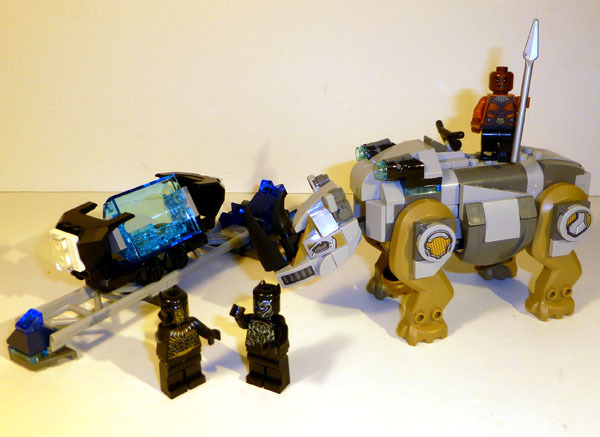 Ever since we got Luke and Vader, I wondered what to-scale vehicles would be like (and I would still like to build a CCBS X-Wing and Tie Fighter), so it was nice for Lego to deliver with one of the smaller vehicle designs. That said, the Speeder Bike isn’t exactly groundbreaking, but it conveys the overall shape and looks great with the figure. (Although it’s not very swooshable with the stand, but it looks great on display.) If they’re going to try to unload more boring Storm Trooper characters on us, then at least give us some cool vehicles to go with them! The Ninjago Movie may have been a bit lackluster, but the sets based on it have been amazing and a joy to build. I’m quite a sucker and have already picked up four of the Ninja’s mechs, including the Water Strider (which I felt was a repeat design with too dark of a color scheme), the Lightning Jet (the build was more solid than I was expecting, but there are just too many bits shooting out everywhere, feels like too much of a mess), and the Ice Tank (which has a cool shell design, but in the end feels just a bit too simple.) I’ve yet to pick up the Green Dragon Mech (the design doesn’t speak to me, but I found one on sale so it’s in the mail) or the Quake Mech (haven’t been able to order it yet, waiting until the New Year deals to go live), but these will eventually be added to my collection. I am a big collector of Collectible Minifigures, and I did snag full sets from the three waves released this year, so I’ll share my favorites. The first wave of Batman figs had some cool Batman suits, secondary forms for the main characters, and some rarer villain designs. My favorites are Glam Metal Batman, Pink Power Batgirl, and The Eraser. That said, it felt like a bit of a mellow theme, and next year’s second series of Batman figs will be one of the few where I DON’T collect all of them. 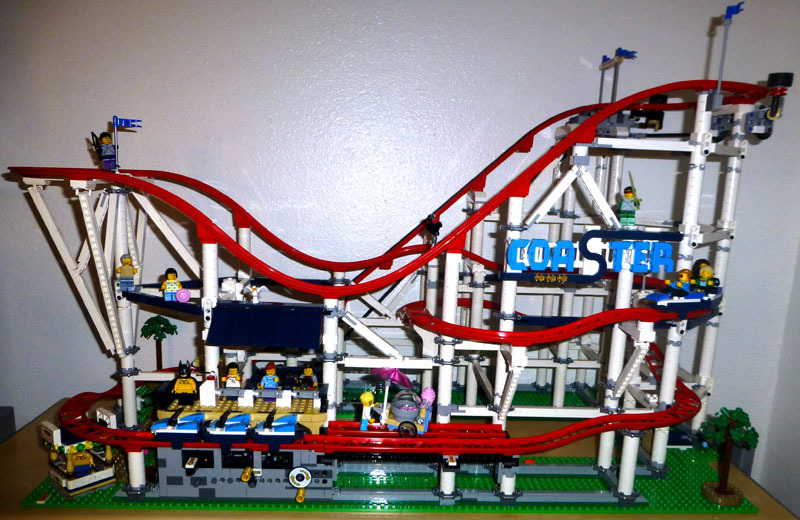 Series 17 was a return to classic CMFs, and its looking like we’re only getting one of these mixed batch waves every year in the future, since they’re starting to enjoy more licensed waves instead. (The rumors next year say we’re getting Batman V2, Series 18, and then a wave of Harry Potter figs.) For Series 17, my favorites were the Butterfly Girl, Rocketship Boy (man, that one was a hard one to find, given its popularity), and the Battle Elf Girl. 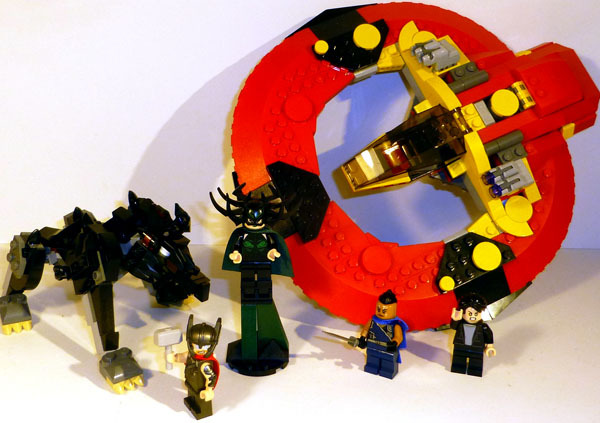 The Ninjago Movie wave was another licensed wave, and there were a couple of designs that I was less interested in. However, it did offer a chance to get civilian outfits for Zane, Cole, and Jay, as well as a few alternate colored fish heads for the Octopus and Angler soldiers, not to mention a cheaper way to pick up Koko. Still, some were a bit too repetitive, like the two Lloyds, Kai, Nya, and Sensei Wu, and they could’ve used a few more civilians to go along with the UniKitty Fan, Sushi Chef, and Punk Rocker. My favorites were General #1, Hipster Jay, and Misako. Anyway, that's my last bit of mini reviews for the year. See ya on the flip side! 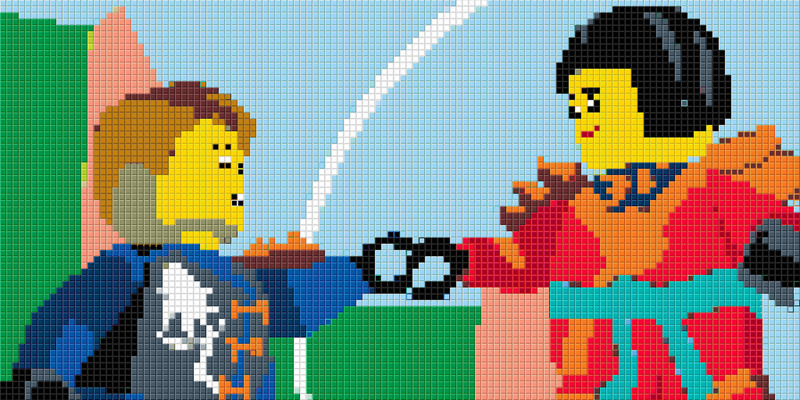 This might be my next mosaic project, based on one of my favorite scenes from the skybound season. I'm not 100% behind the background design... I may need to add subtle details to the buildings and maybe a few more clouds. But I think it could be a fun mosaic. Who Would Want Custom Printed Toa Minifigures? I've been trying to work out a deal for some custom printed minifigure torsos for another project, and then I got thinking about how cool it would be to have printed torsos for the Toa, and then perhaps even printed heads too! 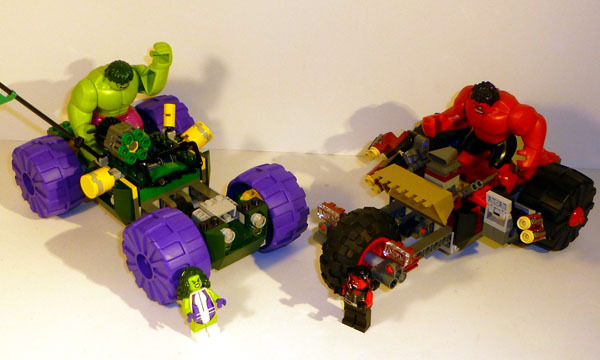 Custom Lego fig prints are more common nowadays, so in theory it wouldn't be too difficult to pull it off. But it would still be pricey... but one way to bring down the price is to order in bulk. 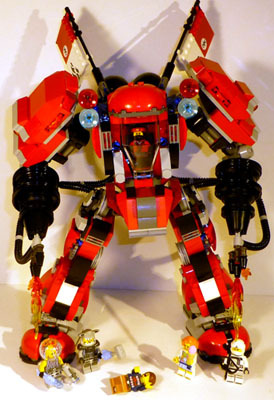 And it occurred to me that there might be other fans out there also interested in Toa figs. Above are four examples of the Toa I was able to make. 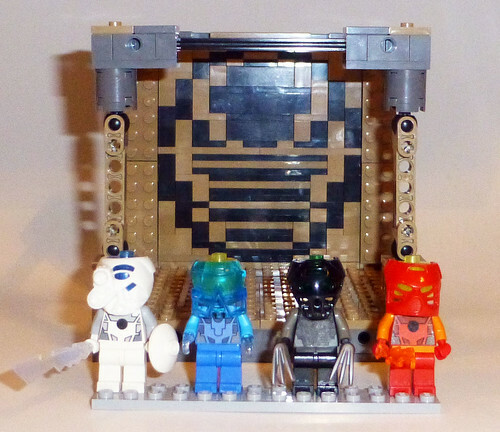 Kopaka utilizes a Ninjago sword and dish for a shield, Gali uses semi-rare Ogel hook hands, Onua grasps some Wolverine claws, and Tahu is holding a flame piece. (I have Lewa and Pohatu, but their "weapons" are not as easily made.) They're using colored beads from the pens to partially fit atop the torsos, and then the masks snap onto the beads. (Those pieces are weak tho... Kopaka's bead has broken on me, and sadly Gali's mask also chipped off.) I was able to bribe Nuju Metru to make me some torsos stickers, but time has not been nice to them. But what about a concept that uses printed pieces and doesn't rely on hard-to-find pen masks? This is a VERY rough sketch of what the Toa could look like. I am fairly confident that the torso designs can be pulled off without issue. The heads are a different beast, because the unique outlines don't translate well to the minifig head shape. I am okay with the designs for the Gali and Pohatu heads, although some color contrast will need to be used to make them stand out a bit more. The Tahu and Onua heads could use some more work, and Kopaka's needs an overhaul because his eye line doesn't match the other's at all. I am surprisingly fine with how Lewa's head turned out; the "cheeks" of the mask translate onto the minifig head well. There are other possibilities too for the heads. They could be printed on larger elements (like the round racing helmets) to give them a bigger size. You could even create custom molds with 3D printing... which is more complicated and expensive than what I'm willing to work with. But they managed to make the Toy Fair Iron Man look good with just a head printing before they introduced custom molds, so I'm optimistic. In general, what I'm looking for is to see if other people have any interest in getting some of these, since it would be cheaper to make them in bulk. 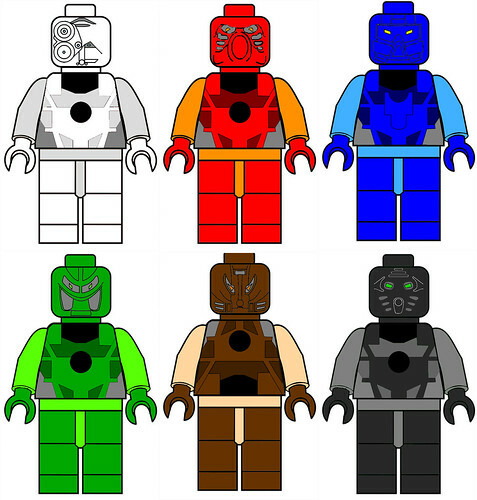 I think the general idea is $10 per printed element, so each Toa fig would be at least $20, maybe more so if you include rare colored legs or weapons. (Getting authentic trans blue Gali hooks would be the worst.) (Even more if we considered leg and arm prints... which I haven't.) If enough folks would like to invest, I'm sure we could get a bulk order together. If not... well, no big deal. Anyway, yeah, this post is to mostly test interest on the concept. Let me know what you think. A true Ninja knows when to admit defeat, and alas I must too. The Lego Ninjago Movie was kinda meh. I mean, it was a good movie and stuff, but it is definitely the lesser of the three Lego movies. In fact, there were some of the TV show seasons that I think would outshine it in terms of story and characters. (Tournament of Elements and Skybound, to be precise.) I thought there was potential that it didn't quite live up to, so yes I was kind of disappointed. I guess one of the biggest issues was pacing. Parts of it felt too rushed (especially in the beginning, we were not eased into the whole concept of Ninjas fighting to save the city) while other parts felt too drawn out (like the emotional scenes in the end.) Sadly, most of the best parts were shown in the trailers. In particular, some scenes which I thought were going to be expanded on to make epic scenes... weren't. Specifically the Lloyd fight with the fridge... I thought it would be an elaborate sequence with him using a lot of props in his fight, very Jackie Chan-esque. But... it was just a clip they showed on the Ninjago news. So we literally saw all of it in the trailer. The one aspect I was looking forward to was the fight sequences, especially when Jackie Chan was behind them, but the movie really failed to deliver. Part of it was 'cause the Ninjas actually weren't fully trained yet, and the few "martial arts" scenes that there were felt too fast paced... I'm guessing Lego stop motion might not be the best medium for martial arts. The range of motion just isn't enough, and some of the scenes just had too much happening in them anyway. (Like WU fighting a dozen baddies, was hard to keep track of what was happening.) The one scene that did stand out was Wu vs Garmadon, which was quite enjoyable, especially when Wu begins tearing up the bridge and throwing the pieces at Garmadon. That one worked, but for a movie that was being hailed as "The Lego version of a Kung Fu movie" I felt let down. Characterization was okay... Lloyd had his whole "discover who he was" bit that worked out well, even if it is a bit cliché. The other Ninjas had some good attempts at personalities, but they clearly did not have enough screen time to really shine. Of the five, the best jokes probably went to Zane, who played the robot bit well. (They even made his movements blockier, which is saying something for minifigure stop motion. When the other characters were running down the hallway, Zane just kinda hovers without moving his legs. Maybe it could be seen as lazy animation, I thought it was a clever visual concept to show that he was different.) I would've liked to see more of Kai, Jay, and Nya (and I guess Cole too) but they were very much secondary roles, who only got chances to shine in brief montages the five would show off their cool movies. (Nothing much was done with Jay's crush on Nya besides a few modest bits of him being awkward.) Would've liked to see more of them, but it figures they'd be sidelined given how large the cast already is. Garmadon was great, and clearly had all the best lines and jokes, and his various generals also got some chances to shine too. 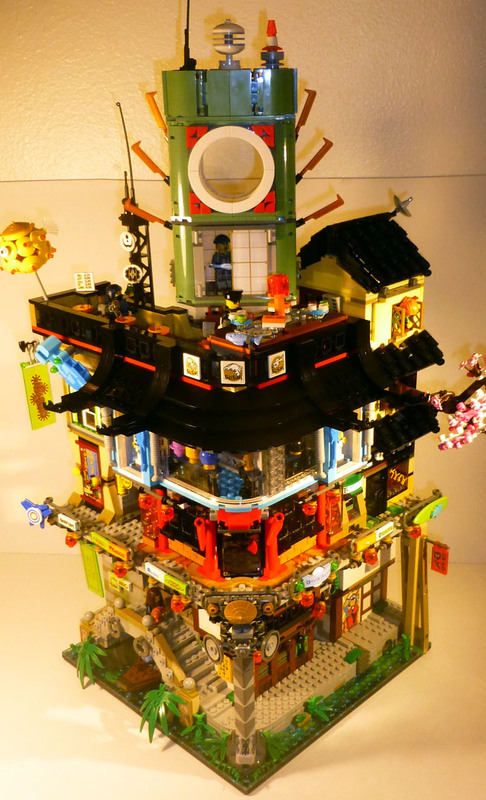 But the best parts of the movie were some of the fabulous designs of Ninjago City. There was a lot there that had a Hong Kong feel, but with modern western themes too. But the design really stood out from BricksBurg and Gotham City from the other two movies. The various vehicles were well done too... although the mechs were a bit short lived, and only had a few brief chances to shine. Even then, Lloyd's dragon hogged the limelight, and there was a feel of some anime-mech sequences in there too. But when the story moved into the jungle... the scenery designs became a bit less impressive, unfortunately. Other favorite bit; the classic Ninjago theme as Lloyd's ringtone. So it was still a good movie, but still a bit of a let down... and I very much went into it hoping for the best. Honestly, now I'm more excited for the next season of the television show. Yes, the animation will be less impressive and it's not like the fight sequences are any better, but the continuing story probably will be. (At the very least, it won't have to work as hard to establish all the characters.) I probably will get the Lego Ninjago Movie when it comes out on disc, simply for the ability to pause and marvel at the scenery and background characters, because soooo much zooms by on the theater screen that I know I missed out on a lot. But still... mixed feelings about this movie, and that averages below my lofty expectations. Anyway, those be my ramblings. Now, the Ninjago video game... THAT looks like it might be fun! So the Ninjago movie comes out this week... or rather, tomorrow. I had been planning to see it Thursday night, only to check and see that, actually, they don't have any showings for it Thursday. And the showings on Friday are either too early in the day (AKA when I'm at work) or too late (AKA going to bed cause I have work on Saturday too.) So alas, I won't be able to catch the movie until Saturday afternoon, making me jealous of everyone who got a chance to see it early. Anyway, despite my earlier reservations, I'm excited for the movie. It looks like it will have some nice comedy and action, and I've come to terms that it won't be the same as the TV show. (Which is continuing on its own anyway.) But I've already read for other AFOL reviews, and they seem to be of the opinion that it's good, but not as good as the other movies, and it exceeded their expectations because they expected it to be a flop. 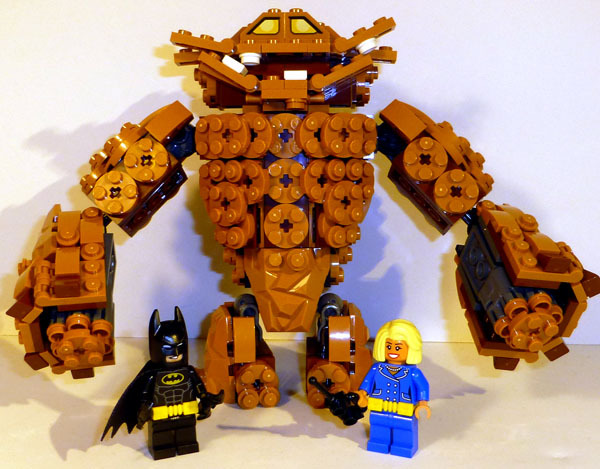 Because, like Bionicle, a lot of AFOLs on certain sites seem to dislike the theme because... I dunno, because it has a story aimed at kids? The Ninjago TV show is a fun cartoon, but it's no Star Wars, and adults who don't like the Power Rangers / Ninja Turtle / Super Hero vibe don't like it. That's fine, but it always seems like some assume that since they don't like it, it should (and will) fail. (Disregarding that it's the one Lego theme that consumers did successfully revive after a cancelation and continues to be a best seller.) Even if some of them like the sets, they only "get it for the pieces" and assume the show and story is worthless. Anyway, that's probably an exaggeration, but that kinda feels like the gist I was getting from the reviews. The "This theme is awful, no way a movie based on it will work" that turned into "Okay, it's good but not AS good as the other movies." 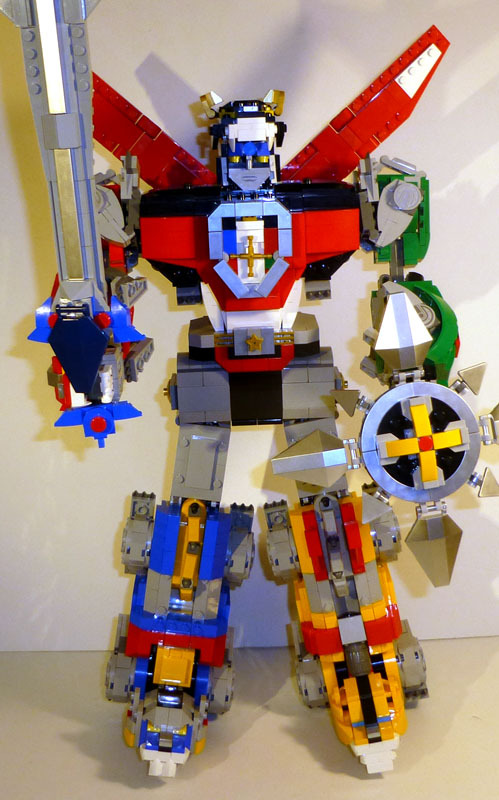 And there's legitimate reason's for it; the original Lego Movie was so awesome that it'll be hard to top or even match. (I think the Lego Batman Movie fell quite short of that.) And maybe it's too soon for another Lego movie to be coming out, because I guess people do start getting bored of more of the same and stuff. But I'm going to ignore that for now. I've read plenty of reviews where people who already disliked the genre ended up disliking the film, and I have high hopes, especially given that every new sequence I've seen clips for brings something new and cool to the table, so I'm optimistic that it'll be good. But the negativity right out of the door is a bit off-putting, even if that negativity is "good, but not as good." Based on the promotional material, we've seen a lot of human Jackie Chan making ninja jokes. So my theory is that the LEGO Ninjago Movie is merely Jackie Chan playing with his Lego collection and making up a story for it.